Today KidLit411 is excited to feature the talented Tina Kügler! Thanks for joining us, Tina! I was a film major at University of Wisconsin-Milwaukee, and moved to Los Angeles in 1996 to find a job in animation. I storyboarded at Nickelodeon, then Disney TV and Warner Bros. TV. My favorite project that I worked on was Gary Baseman's show "Teacher's Pet" for Disney. I was a lead storyboard artist on the feature film, too. It's a really strange movie, I'm proud of it, I contributed a lot of gags-- working on it was a blast. I started doing illustration samples and building a portfolio while constantly bothering Gary for advice. We moved from L.A. back to Wisconsin in 2002, and freelanced animation work (my husband was also a storyboard artist), I was making picture book dummies and sending out postcards and more postcards and getting rejected left and right. We opened a children's bookshop called Tweedle Bros., with the BEST Harry Potter release parties (they hemorrhaged money, but they were spectacular). I was in my element, living and breathing children's books, as the buyer I was poring over publishers' catalogs and PW and SLJ, hand-selling books to anyone who walked in. I dreamed of the day that MY book would be in a bookshop! Despite our fervent love of children's books, we ended up being completely terrible at running a functional business, and closed the bookshop when our third son was born. I then worked at the Manitowoc Public Library in the Youth Services Department, and I realized I was much happier GIVING books to kids rather than selling them. All the while, I was desperately trying to get published, and NOTHING WAS HAPPENING. We moved back to L.A. a few years ago (my husband went back to working in animation), and around the same time, I connected with Teresa Kietlinski with Prospect Agency. And it finally HAPPENED for me. It took 13 years of portfolios, dummies, and postcards! Tell us about THE CHANGE YOUR NAME STORE. How did you land this assignment? Julie Matysik at Sky Pony liked one of my postcards, so she contacted me to do samples for a manuscript. I loved the story, and I loved the multicultural aspect, and it turned out that Julie loved my samples! It's a wonderful read-aloud written by Leanne Shirtliffe, a teacher. Wilma Lee Wu does not like her name, so she finds the Change Your Name Store. In choosing a new name, she must try it out by traveling to the country of origin. I put a ton of names into the illustrations, in all different languages, and it is so fun for me to see kids pore over the illustrations and pick out all the names. I was very fortunate to have help with the names in different languages, our neighbor wrote names in Korean for me, another neighbor wrote in Hebrew, and a good friend contributed Japanese kanji. Leanne made an excellent teacher's guide, available at namestore.wordpress.com. I think it's a perfect first day of school book, when you are trying to learn all the new names! What was the key for you to breaking into the trade picture book business? For me, it was connecting with my agent, Teresa. She has been so supportive, and in bouncing ideas off of her, Teresa's advice has pushed my work to the next level. My first dummy with her didn't end up going anywhere (this happens even with agents), but the second one did: there was a project my husband Carson and I had been working on together on and off for about ten years, since moving to Wisconsin in 2002. It was a picture book biography of a remarkable artist, Mary Nohl, who built these huge, unusual sculptures in her yard in Milwaukee from cement and found objects. Our initial manuscript was totally dry and boring, despite being about such an incredible person, it was just all factual-- no story, no magic. Total snooze. The other problem was that the two of us wanted to collaborate on the art, and we could not find a method that worked. Carson paints with watercolors and I work digitally, how could we combine our styles? So after a while, we just shelved it. I ended up going to my first SCBWI conference in summer 2012, and was actually trying to push a couple of other dummies I was working on, when a presenter mentioned something about how a nonfiction book needs a hook to appeal to kids-- like animals, for example. A bolt of lightning hit me: Mary Nohl loved her DOGS. What if we told her story through her dogs, Sassafras and Basil? And then my brain exploded and I don't remember the rest of the conference but I hammered out an entirely new draft the minute I got home. Teresa loved it and knew we had something special. She steered us in the right direction with revisions and support, and she sold IN MARY'S GARDEN to the wonderful Kate O'Sullivan at Houghton Mifflin. It has been an absolute dream come true. Carson and I experimented again with creating art together, and finally found our collaborative illustration method with mixed media and digital collage. We came up with a whole that was infinitely better than the sum of its parts. We just got our first proofs from the publisher, and I am completely amazed that we made this. I can't wait to introduce Mary and Sassafras and Basil to the world! IN MARY'S GARDEN comes out March 17, 2015. What is one thing you learned that you didn't know about picture book publishing after going through the process? How slooow it goes! With animation, I was used to extremely short deadlines and quick revisions. Carson & I signed the contact for IN MARY'S GARDEN in 2013, the art was due in 2014, and it comes out in 2015. I still can't get my head around that! What projects do you have coming up, or are you working on? 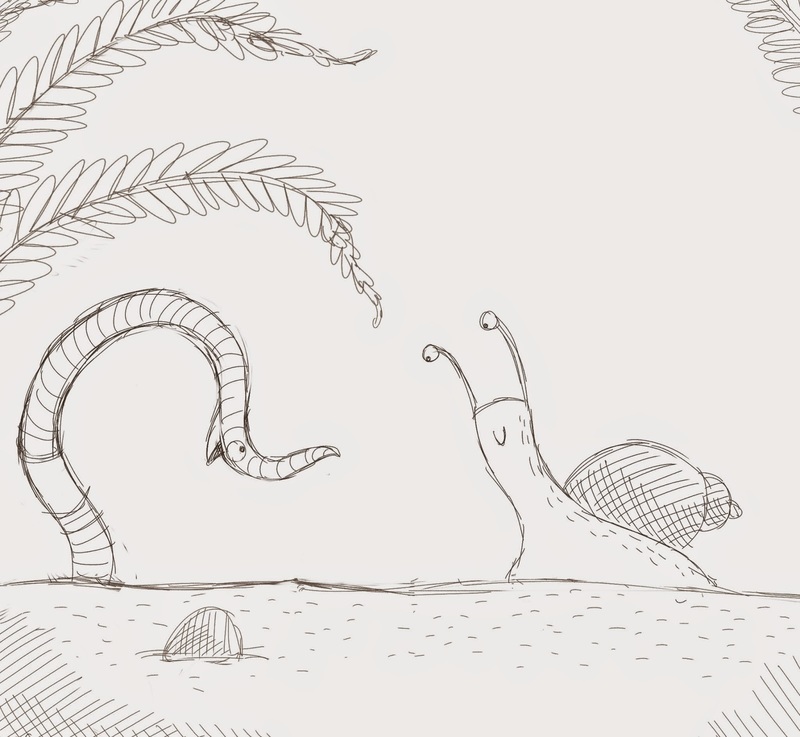 Right now I am working on art for SNAIL & WORM, a picture book I am writing and illustrating for Houghton Mifflin (also with Kate O'Sullivan), coming out Spring 2016. It is a collection of three easy-reader type stories in a picture book format, about, well, a snail and a worm. I am also illustrating NO MORE BEIGE FOOD, a sequel to CHANGE YOUR NAME STORE, coming Fall 2015. Carson and I are working on the book trailer for IN MARY'S GARDEN, as well as tightening up our dummy pitch for a follow-up book, plus thumbnailing roughs for another idea together. I also have another picture book dummy that I wrote and illustrated out for submission as we speak! What is your typical process for making an illustration? I work digitally from start to finish. I have a Wacom Cintiq tablet, and usually draw roughs in Photoshop. 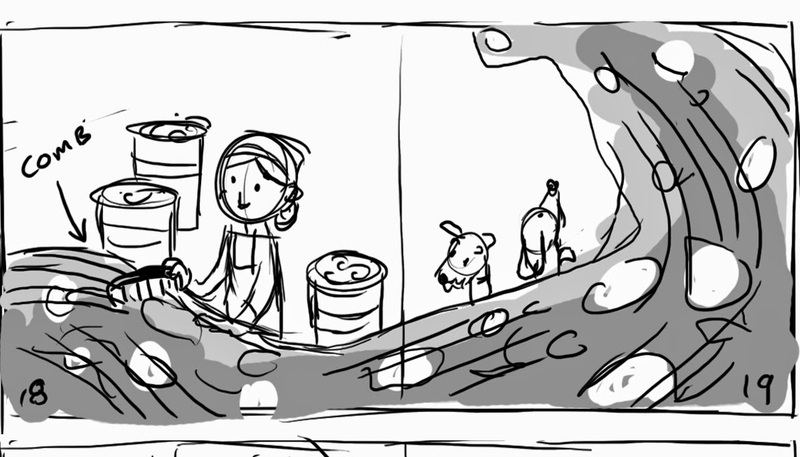 I start with small, loose, Sharpie-style thumbnails and go bigger and more refined from there. My brain still works in storyboard panels, and I see the book in my head like a movie playing, with page turns as the cuts, spot illustrations like a montage sequence, spreads as camera pans. Then I ink (well, pencil) and paint digitally, but I don't want my art to look computer-y, so I layer in scans of old paper and other media to add depth and interest and warmth. Despite working digitally, I'm not very good with the computer, I've never taken any classes on the software. I just try to do what I would do with real media, no filters or masks or whatnot, I don't know how to use them. So I never do tutorials or process videos because I am certain I am doing everything backwards and completely wrong and everyone will laugh at me. Be yourself. Develop your OWN style, because that is something no one else can do. All illustrators are inspired by other illustrators, keep a collection of picture books as reference, Pinterest is a great resource too. But! Don't just blatantly mimic a style you like. Mary Blair was the best at doing Mary Blair. You are the best at doing YOU. Watch good (old) cartoons & movies with the sound off. Study the compositions, cutting, pacing, screen direction. How is emotion conveyed without sound? Learn the 5 C's of Cinematography (continuity, camera angles, composition, cutting, and close-ups), because they apply to picture books just as much as they apply to film. For real. Go to the library and check out as many picture books as you can carry. Crawl around the stacks on your hands & knees and find some gems. Study them. What works? What doesn't? Where does the magic come from? Join SCBWI, and go to a conference if you can, it is incredible, you will be completely reinvigorated. It is like that part in ARROW TO THE SUN by Gerald McDermott, where the boy goes through the Kiva of Lightning and is transformed, enlightened. This will be you. Network with other kidlit illustrators. Authors, librarians, teachers, booksellers too. Be nice to everyone. Be happy for one another's successes. The kidlit world is incredibly supportive. In college, I worked on a stop-motion animation student film called "The Publegg Enemy." It was a parody of old gangster films, with birds, and it actually ended up being screened in the 1997 Annecy Animation Festival in France! It was an amazing experience, I adore stop motion, and my favorite part was helping to create all of the little background details in the sets and props. I met Carson on the project, we were both hired as interns. Years later we found out we were the only two that applied! My primary website is tinakuglerstudio.com, and the website for my work with Carson is studiokugler.com. I am also on Twitter as @tinatheatre. Author-illustrator Tina Kügler lives in the Los Angeles area with her husband, three boys and an enormous hairy dog named Harryhausen. A former animation storyboard artist, she also owned a children's bookshop and worked in a library, where her storytime singing made small children weep with terror. Tina is also a Cub Scout leader and has little to no spare time. Tina's enthusiasm for her work shines through. Now I am all excited about a book that won't come out til next Spring too! And talk about persistence - so glad it's paying off for her . Thanks for such a wonderful interview, KL411! Thanks so much for letting us get a "glimpse" into your talent, Tina! Your art is fabulous! It's nice to learn more about Tina Kugler. 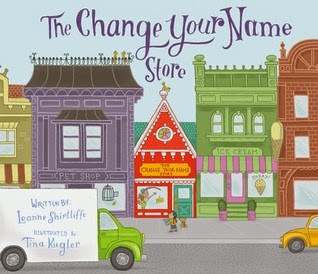 I did a short review of The Change Your Name Store on my blog; please take a look: http://frogonablog.wordpress.com/2014/06/19/the-change-your-name-store/. Can't wait for 'In Mary's Garden'. Mary is one on my favorite artists and being in Milwaukee, I get to appreciate her work in person. Love the look of the cover!